The Taipei City Government hosts the“International Tour de Taiwan”and the“Taipei International Expressway Marathon,”plus other international events that can promote international sports exchanges, encourage friendships among countries, improve the technical standards of sports and stoke the interest of the public as both participants and audience. Liu Yan-jie, title holder of the men's team in the Citizen Procession Contest at the Tour de Taiwan. 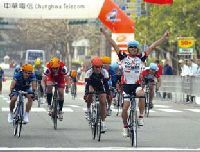 The“2008 International Tour de Taiwan ”was the 4th such event to be held in Taipei as a branch leg; it is organized in coordination with the“Taipei International Cycle Show” every year in March. The 2008 event was held at eight different stops; the 7th stop was conducted on March 15 on the roadways surrounding the TWTC Nangang Exhibition Hall. The grand finale - the final destination - was held on the roadways surrounding the Taipei City Hall. Prior to the Taipei stop event, the Elite Athletes Procession was conducted to encourage citizen participation. Hundreds of cyclists from over twenty countries, including Germany, France, Australia, and Japan, partook in the tournament. The“Taipei International Expressway Marathon” started with a bang at 6:00am on March 23, 2008 around the Wugu and Xizhi Viaducts on National Highway Number 1. Nearly 10,000 runners enjoyed a hearty jog in the balmy weather. The tournaments on offer were full marathon and half-marathon championships. This tournament is the only marathon held on a national highway. At the break of dawn, nearly 10,000 competitors thronged to the event, rendering it a grand occasion. Gales of laughter amid water sports activities. The“2008 Taipei Rowing Championships”were held at the Dajia Riverside Park on September 18 and 19. Teams from schools and organizations across Taiwan, consisting of skilled western-style rowers, registered for the competition. The number of water sports activity enthusiasts has surged, making rowing and kayaking the most unique water activities in Taipei City. Fierce competition between the R.O.C. and Indonesian teams. The“2008 Asian Youth Girls' Volleyball Championships”is the official biennial championships under the Asian Volleyball Confederation; it is known as a test event in the Asian region for the International Championships, and the first official international event for Taiwan. The top three teams can represent Asia to participate in the FIVB Federation Internationale de Volleyball Championships. It is thus highly regarded by various Asian countries. The tournament was held at the National Taiwan University Gymnasium from September 20 to 28, 2008, and was graced by 11 teams from mainland China, Japan, South Korea, Kazakhstan and other countries. Japan won the championship, with Chinese Taipei as the runner-up, and mainland China as the third-place winner. This tennis tournament was held from October 18 to 20, 2008, at the National Taiwan University Gymnasium and the Taipei Arena, featuring prominent international female tennis players. Taiwan's own tennis players took this golden opportunity to emulate and learn from these international athletes. The tournament also worked in coordination with Taipei's city marketing, and by means of sports and cultural exchanges, the Taipei City Government sought to align itself with the international community and thereby improve Taiwan's international image. The“2008 Asian Short-Track Speed Skating Trophy”was held from November 14 to 16, 2008, at the Taipei Arena. The event was graced by outstanding skaters from Hong Kong, Japan, India, China and other Asian countries, upgrading this particular tournament to a world-class competition, and garnering much respect from the International Skating Union (ISU). Taiwan's Lin Yu-ci, 12, won a silver medal in the 1500m race in the Novice Girls category, plus a silver and a bronze in other relay matches. As athletes make the turn, their graceful movements are captured on film. 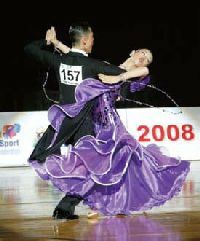 The“2008 IDSF Taipei International Open and Asian Championships”was held from December 6 to 7, 2008 at the Taipei Arena, featuring 192 pairs of top dancers from 29 countries. The first prize went to Japan; the second and third prizes went to Hong Kong in the 2008 IDSF's International Grade Senior Standard category; in the International University Latin category, Chinese Taipei picked up the first and third places; second place went to South Korea. With a view to aligning Taipei's marathon events with international competitions, the“ING Taipei International Marathon”was officially rechristened the“ING Taipei Marathon”in 2008. It kicked off on December 21, 2008 at the Civic Plaza at Taipei City Hall, setting a new record of over 100,000 participants; this event is now hailed as the world's largest city marathon. In terms of community participation, it has well surpassed the world-renowned New York Marathon. The 2008 competition categories included the Full Marathon, Half-Marathon, Road Run, and Children's Fun Run. A Warmup Game was held before the official tournament on November 8 at the Taipei Municipal Datong High School as an Interschool Primary School Relay Game. Starting in 2004, the“ING Taipei International Marathon”pioneered in using a wafer timer for timing the contestants; in 2008, the country inaugurated the“Instantaneous Score Display System”at the event to integrate tournament data with the wafer systems. In this way friends and audiences at the event or overseas could root for the athletes simultaneously by means of this new device, sharing the runners' joy at completing the race. The service redefined the“2008 ING Taipei Marathon”as an international gala and set a new milestone. Dancers from around the world dance and glide elegantly on the floor. The“2008 Taipei International AA Baseball Invitational Tournament”was held amid much fanfare between November 24 to 27, 2008 at the Tianmu Baseball Stadium, Xinsheng Stadium, and Shezi Island Ballpark. Five international teams, including those from Japan's Nagoya, Japan's Aichi-ken, Fukuoka-shi, South Korea's Seoul, Hong Kong, and twenty local Taiwanese teams from Taipei City, Taipei County, Keelung City, Taoyuan County, Yilan County, Taitung County and others participated in the tournament. Japan's Aichiken won the championship; Taipei Municipal Dali High School's junior high division came in second place; Japan's Fukuoka-shi took home third place; and Taoyuan Hsinming Junior High School garnered fourth place. The progress of the match was fierce – never a dull moment.